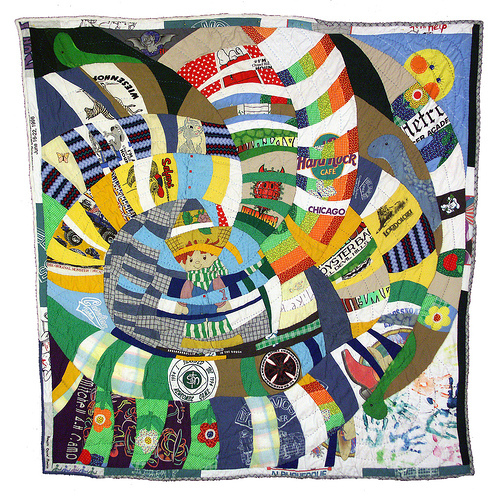 dear ada, one of my favorite art blogs, posted recently about passage quilts...quilts made from the clothing of those who have made a passage in life (i.e., a birth, wedding, death, or perhaps a retirement or recovery from an illness, etc.). these quilts serve to commemorate and/or honor those passages, or those people. 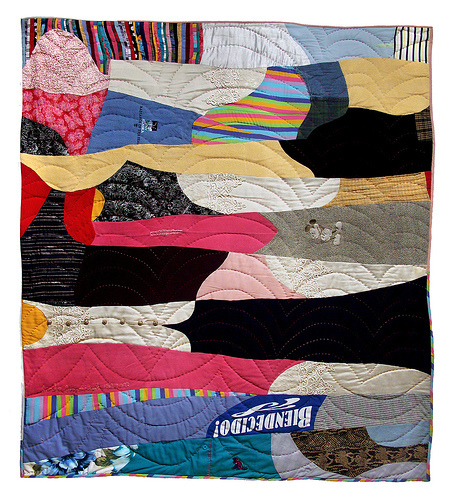 "[begins]with the architecture of the clothing, these quilts are pieced without a predetermined pattern. this process provides the maker an opportunity to examine his or her life patterns. many of the quilts on the passage quilt site honor a deceased person, and employ clothing that that honored individual wore during his/her lifetime. 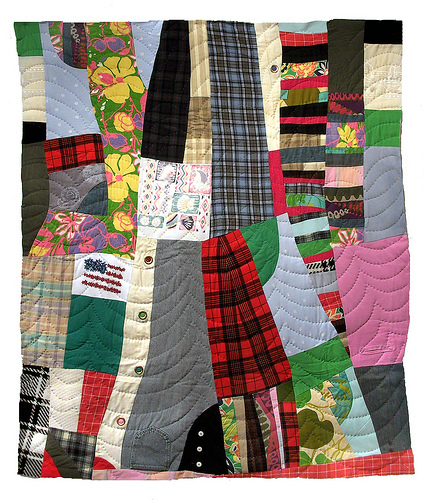 i love quilts, i love quilting. i feel that quilting can be and really is an art in its own right. and i'm clearly fascinated by clothing, fashion, style, and the meaning of all those things, in a broader sense. the fact that these quilts use a person's clothing as the source for the fabric, delights me, as they are a deliciously meaningful intersection of my own personal interests. clothing, in and of itself, is meaningful, rife with messages. even hanging on a hanger, apart from a person. it's style, craftsmanship, source (check the tag!) all suggest a story. but when we step inside of our clothes, make them our own, take them into our fold, and our closets, and fill them out, mixing and matching and layering them with other things we own and love and feel the need to wear (either by custom or choice), we give our clothes even more meaning. our clothing speaks louder, and with more complexity, with us inside of it. we form our own stylistic language, give even subtext to the story the clothes already embodied, sans our bodies. and our clothing, once we have worn it, also has meaning for others around us: our familiars...our families, friends, colleagues, acquaintances. they see us in certain pieces of clothing, and they add a visual memory of each piece, each look we don, to their own (sub)conscious, collective memory of us, of who we are and were. when we shuffle off this mortal coil, we may (and often do) leave behind the fibers we once wore. they can help our memory to live on, in the minds of those who loved us. we can, in a sense, keep speaking, can keep telling the stories of who we are, or once were, once we are dust. the somewhat haphazard, improvisational piecing of the quilts shown above also strikes me as being like memory too...little shards of this garment or that garment in the quilts are, in most cases, arranged in an organic fashion. memories and thoughts themselves are not always linear, they come in fractured, incomplete flashes, not always in a sensical order. they aren't always beautiful (together or apart), they don't always make sense, but in the end, they are personal, and when put together, make a powerful statement about the story of a person's life. what would your passage quilt look like? what would it say about you? what would you like it to say about you? what pieces of your clothing would you want to have included in such a quilt?